Jezz Goldson-Williams (stripes) in action for Peterborough Northern Star against Rothwell Corinthians. Photo: Tim Gates. Peterborough Sports have predictably taken a step up in standard in their stride. The United Counties Division One champions are now top of the fledgling Premier Division table after two wins, nine goals scored and none conceded. Sam Wilson (stripes) of Peterborough Northern Star in action against Rothwell Corinthains. Photo: Tim Gates. Josh Moreman was the hat-trick hero of Sports’ 6-0 win at Harborough Town today (August 13). Mark Jones - odds-on to win the division’s mythical golden boot prize - added two more and central defender Josh Sanders completed the scoring. Sports are one of only three teams with 100 per cent records from two games. Sleaford and Rothwell Corinthians are the other two. Rothwell maintained their fine start with a come-from-behind win at Peterborough Northern Star. Levi Wright did shoot Star in front in the first half, but their visitors to Chestnut Avenue hit back to win 2-1. Star are one of four teams to have lost both of their opening games. Harborough, Boston Town and Wisbech Town are the others. Josh Moreman (blue, winning header) claimed a hat-trick for Peterborough Sports at Harborough. Wisbech had the misfortune to face mighty Peterborough Sports (they lost 3-0) and last season’s runners-up Leicester Nirvana in their opening two matches. Nirvana sneaked home today by a single goal scored just before the hour mark. Holbeach United have four points from their opening two matches, but they had to fight hard for their 2-2 draw at Cogenhoe today. The Tigers were twice behind, but equalisers from Stuart Eason (penalty) and Jake Clitheroe rescued a point and ensured a late red card for Jamie Stevens for foul and abusive language wasn’t too costly. Yaxley turned a 1-1 half-time scoreline into a 3-1 home win over Desborough to open their win account for the campaign. Dan Cotton scored twice with Matt Sparrow also on target. Deeping fought back from 3-1 to draw 3-3 at home to Sileby Rangers. Scott Mooney, Scott Coupland and Will Bird scored their goals. 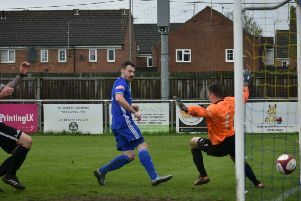 In Division One Whittlesey Athletic made it three games unbeaten and fourth-place in the league as they came from behind to win 2-1 at Buckingham Town. Liam Harrold and Adam Piergianni scored. Bourne are off and running following a 3-1 success at Lutterworth Athletic. Zak Munton scored for the third straight match with Scott Collins and George Collins also scoring. Dan Evans claimed Blackstones’ consolation goal in a 3-1 home defeat to Raunds. Some great goalkeeping by Dave Beeny and a late Lewis McManus goal earned March Town United a 1-1 draw at home to Halstead in Division One of the Thurlow Nunn League, while there was disappointment for Stamford AFC and Spalding United on the opening day in Division One South of the Evo Stik League. Newly-relegated Stamford were a goal down in three minutes and lost 3-1 at home to Witton, while Spalding were 2-0 ahead at Bedworth United thanks to a brace from new signing Bradley Wells, but drew 2-2 against a side reduced to 10 men in the 15th minute. Division One South: Bedworth United 2, Spalding United 2 (Wells 2): Stamford 1 (Robbins), Witton Albion 3. Premier Division: Cogenhoe United 2, Holbeach United 2 (Eason, Clitheroe); Deeping Rangers 3 (Mooney, Coupland, Bird), Northampton Sileby Rangers 3; Harborough Town 0, Peterborough Sports 6 (Moreman 3, M. Jones 2, Sanders); Huntingdon Town 0, Kirby Muxloe 2; Leicester Nirvana 1, Wisbech Town 0; Peterborough Northern Star 1 (Wright), Rothwell Corinthians 2; Yaxley 3 (Cotton 2, Sparrow), Desborough Town 1. Division One: Blackstones 1 (Evans), Raunds Town 3; Buckingham Town 1, Whittlesey Athletic 2 (Harrold, Piergianni); Lutterworth Athletic 1, Bourne Town 3 (Collins, Couzens, Munton). Division One: March Town United 1 (McManus), Halstead Town 1; Woodbridge Town 1, Wisbech St Mary 1.